Online counselling. Counselling to improve feelings. 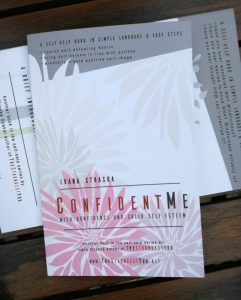 Confidence – Ivana Straska, M. A. A shaky self-confidence or insistent doubts stop many people from pursuing their passions. Many clients I work with do not pursue their desires because of little confidence and many self-doubts. Why is confidence so important? When people are confident they tend to feel positive about themselves and life in general. Their actions are beneficial and productive. They improve their performance and relationships. They positively impact others and become role models. Their company is searched by other people. Don’t confuse confidence with arrogance. Contrary, confidence is a positive trait a person can offer, and use for personal or professional achievements and success. For many years, I had been drowning in self-destruction. As a young woman, ambitious and terrified of failures, I over-loaded myself with doubts, which I compensated by demands and “must – do”. When I achieved, immediately new demands came into play. I didn’t give a chance myself to enjoy, savour when others show their consideration. It took a while until I realized that my self-doubts were so powerful that I actually did not notice my perpetual motion. I instinctively focused on needs of everyone else but myself, and taking time for me did not come natural. Brought up in the environment bombarded by beliefs about women and their roles, surrounded by religious beliefs and social expectations, bound by standards of others, I did not dare to be confident. Not anymore. All changed through personal development. I reversed dysfunctional beliefs the way to positively respond to life, work and social circles. With the development of confidence I became able to pursue my goals and wants without self-sabotaging. I advance with confidence. Once people believe in themselves, they can take risks. They enhance curiosity and spontaneity. The changed ideas about self-worthiness and positive beliefs about personal capabilities to handle future situations nurture confidence. Confident people can successfully face to day-to-day challenges. They are energized and motivated to achieve their goals. They can experience that revealed through their life. My self-help book guides the reader to become confident and build solid self-esteem.